The T. E. Lawrence of Afghanistan. It's some 400 miles from Harvard Square to Capitol Hill, but when Rory Stewart made the trip last month, he chose an unlikely mode of transport: He took a plane. Stewart is an inveterate, epic walker. He spent part of this past summer strolling the 150 miles from Crieff to Penrith in his native Scotland. 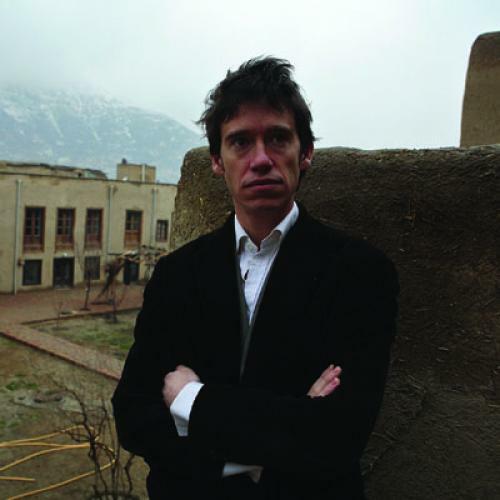 More impressively, in 2002, not long after he quit his job with the British Foreign Office, he walked across Afghanistan, a 600-mile jaunt that served as the basis for his best-selling book The Places In Between. Indeed, his Afghan adventure was only one leg of a 6,000-mile journey by foot through six Asian countries that took nearly two years to complete. But these days, Stewart, who's now a professor at Harvard's Kennedy School, doesn't have time for such peregrinations. He's too consumed by the debate over the Obama administration's Afghanistan policy. Stewart went to Capitol Hill in September to testify before the Senate Foreign Relations Committee, which was just his latest encounter with American policymakers, as he has become a leading--and unlikely--voice for the increasingly popular view that Obama himself once mocked John McCain for espousing: namely, that in Afghanistan, America should just "muddle through." "It's an administration which has boxed itself in in a range of ways, and I think a lot of it is the president himself," Stewart told me one recent afternoon as he sat in his Harvard office, a spartan space with half-filled bookshelves and an Afghan rug on the floor. "The president has taken the position, at least in his speeches, where the very narrow objective of counterterrorism could only be achieved through an incredibly maximalist comprehensive vision which extends to defeating the Taliban, building a legitimate and effective state, stimulating development, stabilizing the region, et cetera." At 36 years old, Stewart, who has long brown hair and the whippet-thin build of a long-distance runner (or, in his case, walker), already has experienced a lifetime's worth of maximalist undertakings. After his walk across Asia, he spent a year working for the Coalition Provisional Authority as the deputy governor of two Iraqi provinces. Today, in addition to teaching Harvard students, he runs a 350-employee NGO in Kabul that's devoted to teaching Afghans traditional crafts skills. The son of a British diplomat, Stewart was raised in Malaysia, where he rafted in rain forests and was taught by his father to box and fence; later, at Eton and then Oxford's Balliol College, he received a traditional British upper-class education steeped in classics, philosophy, economics, and history. Admirers and detractors frequently compare Stewart to T.E. Lawrence (about whom he recently completed a documentary for the BBC), although Stewart himself prefers to think of the nineteenth-century explorer David Livingstone as a better historical analogue. And yet, for all his obvious ambition, Stewart believes the key to any successful U.S. policy in Afghanistan is modesty. "What muddling through is really about is recognizing that we don't have all the answers," he says. "It's not as if we have some amazing high modernist ideology that we're kind of engineers of the human soul or central planners who are going to come out and create an ideal state. We don't have that ideological certainty, we don't know what we're trying to do, nor do we actually have the power. We don't have the kind of authoritarian weight to impose this on another country. Nor do we have the knowledge." He continues: "In that kind of situation, you're much better off making small, incremental steps which are reversible. You can try something, if that doesn't work, you can back off and try something else." It's a view Stewart has advocated publicly in articles and interviews and privately in meetings with Hillary Clinton, Richard Holbrooke, and David Petraeus (among others), all of whom have sought out his advice. But, as Stewart and his allies in the Afghanistan policy debate ruefully note, his view has so far failed to move the administration. "He gets talked to a lot," says Michael Cohen, a foreign policy analyst at the New America Foundation, "but no one seems to listen to him." Or, as Stewart put it earlier this year in an interview with the Financial Times: "It's like they're coming in and saying to you, 'I'm going to drive my car off a cliff. Should I or should I not wear a seatbelt?' And you say, 'I don't think you should drive your car off the cliff.' And they say, 'No, no, that bit's already been decided--the question is whether to wear a seatbelt.' And you say, 'Well, you might as well wear a seatbelt.' And then they say, 'We've consulted with policy expert Rory Stewart and he says. ...'"
What would Stewart's version of muddling through in Afghanistan look like? While General Stanley McChrystal's counterinsurgency plan calls for more than 100,000 American troops, and Joe Biden's bare-bones counterterrorism proposal reportedly keeps troop numbers around their current level of 68,000, Stewart believes the foreign-troop presence in Afghanistan should actually be reduced--all the way down to 20,000. Those troops would then be used exclusively to fight Al Qaeda terrorists; the Taliban would no longer be an enemy. At the same time, while Stewart's plan envisions continued aid to Afghans to support electricity, water, health, education, and agriculture development, the United States would cease with its state-building project and essentially leave the Kabul government to its own devices. Stewart's plan stems from his strange mixture of pessimism and optimism. On the one hand, he argues that the Afghan central government lacks the strength or legitimacy to actually run the country, nor does he have much faith in the ability of the United States to help it on those counts. "I have some friends in Afghanistan who will say, ‘If the U.S. government is infinitely flexible, capable, superbly informed, able to deliver programs precisely in every rural area, and its soldiers are able to avoid killing anybody and can identify exactly which tribal chief at the sub-district level to deal with, everything will be fine,’" Stewart says. "To which my answer is, 'That’s a big if, and that’s not how our bureaucracies and administrations work.'" But Stewart also believes that things in Afghanistan aren’t as precarious as some fear. "There’s a certain kind of worst-case scenario view that Afghanistan is like this horrendous nightmare and, if we don’t get in there and sort it out, we’ll have global jihad, we’ll have a completely destabilized region, terrorists will have their hands on Pakistan’s nuclear arsenal, American credibility will be finished forever," Stewart says. "And these are not really, I think, fully developed positions." Under a "muddling through" plan, Stewart concedes that the Taliban might take some provincial capitals in Southern Afghanistan, but he believes that the Hazara, Tajik, and Uzbek populations are stronger than they were in 1996 and, thus, would be able to keep the Taliban out of their areas. He also thinks it would take a minimal foreign military presence to prevent the Taliban from marching into Kabul. With the Taliban confined to certain parts of Afghanistan and its ability to exploit the ideology of religious resistance lessened due to the absence of a substantial foreign military presence, the rest of the country would, with substantial foreign assistance, be able to develop. Although his walk across Afghanistan led Stewart to believe that the country is, in some respects, ungovernable, it also gave him great faith in individual Afghans, on whom he depended for food, lodging, and frequently directions. (He didn’t carry a detailed map on his trek, since it might have made people think he was a British spy.) "We do consistently overestimate our own capacity and underestimate the capacity of others," he says. "In every case, Afghans are more competent, more canny, more capable than we acknowledge, and we are less so." Stewart’s biggest bugbear is the doctrine of counterinsurgency, which he believes feeds maximalist visions. "I think counterinsurgency has become this very, very funny catchall," he complains. "One of the ways in which it operates ideologically is that it’s very, very good at bringing on board humanitarians and academics, because it’s always saying it’s not just a military solution, or we need to do hearts and minds, we need to look at development, we ought to be cautious as to aerial bombardment. So you get this situation where it neutralizes a lot of criticism. It in fact incorporates an enormous number of people who, in previous interventions or theaters, have been quite critical of military operations." He recalls his recent appearance before the Senate Foreign Relations Committee, where he testified alongside two counterinsurgency advocates. "I’m listening to them and I’m thinking, ‘You’re wrong, but what you’re saying sounds very, very smart, and I can see that half these senators are going to be convinced by this, so what on earth can I say now to try to expose the hole in your argument? How am I going to be able to show these senators that, although these guys are incredibly articulate, slick, have all these references to statistics at their fingertips, it’s not going to work?’"
Not surprisingly, counterinsurgency advocates have their own problems with Stewart. Andrew Exum, who participated in McChrystal’s Afghanistan policy review, is a fan of Stewart’s writing and admires his sense of adventure, but questions just how much he really knows about the situation as it currently exists in Afghanistan. "I think the first twenty-two pages of the McChrystal assessment of the war in Afghanistan were more grounded in evidence-based reality than Rory’s was," Exum says. "That’s not to say he’s delusional, just that he has a very limited view of Afghanistan and operations there." Stewart and his critics do agree on one thing: It’s unlikely his proposal will become policy any time soon. Which is why Stewart is thinking longer-term. "What I’m in the game of doing is not changing the president’s decision to deploy troops next week," he explains. "What I’m in the business of doing is trying to pitch forward two years, three years time, trying to sense the arc of history" so that, when Afghanistan policy inevitably comes to another crossroads, Stewart’s position carries the day. In the meantime, he enjoys teaching his Harvard students to be "states-people," likening his professorship to the job he had back in his Oxford days when he served as the summer tutor to Prince William and Prince Harry. "It can feel, for an Englishman, a little bit like being a Victorian schoolmaster," he says of working at Harvard. "You get the sense that you’re teaching classical Greek but they’re all going to go out and do whatever they’re doing in India." He adds, "It’s the perfect kind of teaching for a kind of slightly anachronistic person like myself." But Stewart’s time in Cambridge might be short-lived. Although he only arrived at Harvard last year, he’s already plotting his exit strategy, as if still searching for a twenty-first-century role to fit his nineteenth-century character. At the moment, he’s running for Parliament as a Conservative candidate and, by next May, he could be back in Britain as a member of David Cameron’s government. The prospect clearly pleases Stewart. "If I were lucky enough to become the deputy foreign minister or the minister for Afghanistan," he said in his office, as a slightly dreamy tone crept into his voice, "my influence on Afghan policy would be much, much heavier than being a professor at Harvard."